Adjusting the printer settings may solve banding problems and Color matching issues. Two print settings affect print quality and color matching on a LX400: Quality and Color Matching. Print Quality. 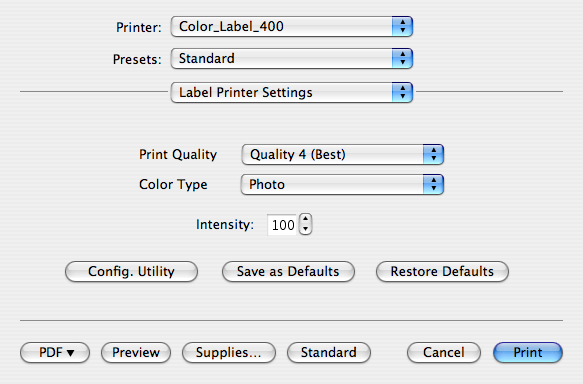 The Print Quality setting can be adjusted in the Printing Preferences area on a PC or the Label Printer Settings area for a Macintosh. You can adjust the quality in four increments. Quality 4 produces the best looking print but at a slower print speed. Quality 1 produces the fastest print possible by sacrificing some quality. Color Matching. 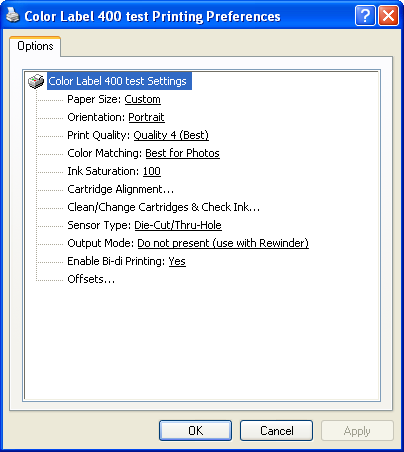 Color Matching can be found in the Printing Preferences area on a PC or the Label Printer Settings area for a Macintosh. Photo mode is best used for photographic images where accurate color reproduction is very essential. Images printed in this mode will look lighter than those printed in Photo mode. Skin tones especially will look more natural in this mode. This is the default setting. NOTE: Exact color matching of the printed label to the screen may never be possible since there are factors that affect this out of the driver's control. The surface of the label reacts with the ink in the cartridge to produce the color. For this reason, when printing the same image to different brands types of paper with different printable surfaces the printed output can look entirely different. If you have designed a label in another program such as Adobe Photoshop or Illustrator Print Quality or Color Matching problems may be the result of improper image format. This could also be true if you have imported a graphic or a background created in another program into the NiceLabel (PC) program. Graphics from websites or proof PDF files are "screen graphics" which means they look fine on a computer screen but they are not of a high enough resolution to print correctly. Here are the specific image formatting issues to look for. File Type. If you are printing an image file directly or importing an image or a background into NiceLabel, certain image formats work better than others. Try JPG, TIF, BMP. All of these format choices are available from the "Save as" or "Export" screens of popular graphics programs. Ink Saturation. In any mode or quality setting you can cause the image to look lighter by decreasing the saturation. The default saturation level is 100. Media type/Label Surface . Try new labels. There is a wide variety of label stock on the market. Most of these are not formulated for ink-jet printing. The high gloss and semi-gloss custom and standard labels that we sell at www.primerastore.com are very good for ink jet printing. Although both stocks will work with any label, the high gloss stock is best for labels that have rich graphics and photos and the semi-gloss stock is best for labels with text, barcodes or simple line graphics. PC: Go to Start - Control Panel - Printers and Faxes - Right click on the specific printer - Choose Printing Preferences or click on the options/preferences button in the specific program you are printing from. MAC: Go to Label Printer Settings in the Copies and Pages drop down on the screen before you print.